Home › Dehumidifiers › Refrigeration – Back at it! Oh my; where to start? I’ve been away from the blog so long, and have so much to discuss, I fear I know not where to start. I’ve written quite a bit about refrigeration in the past, but that was mostly theoretical. You see, I have a love for antique refrigeration texts, primarily those which focus on domestic refrigerators. There is so much to be learned from these old engineering books. For one thing, they were written better than modern text books. I can get more from two or three pages written in 1926 than I learn from an entire modern text book. I suppose there was a different culture then where a designer, builder, and operator might be the very same person. These texts instilled common sense into the reader. Anyway, if you’d like a sample of these, check out the listings on the HVACR page of my blog; I have practical experience to share. Now, My practical refrigeration knowledge has been rather limited. Some years ago, I acquired a number of old dehumidifiers and Jerry rigged them into at least one good working model, utilizing propane as the refrigerant. Also, I did some strange things like cool and dehumidify a space and pass that heat on to a cooler full of water. 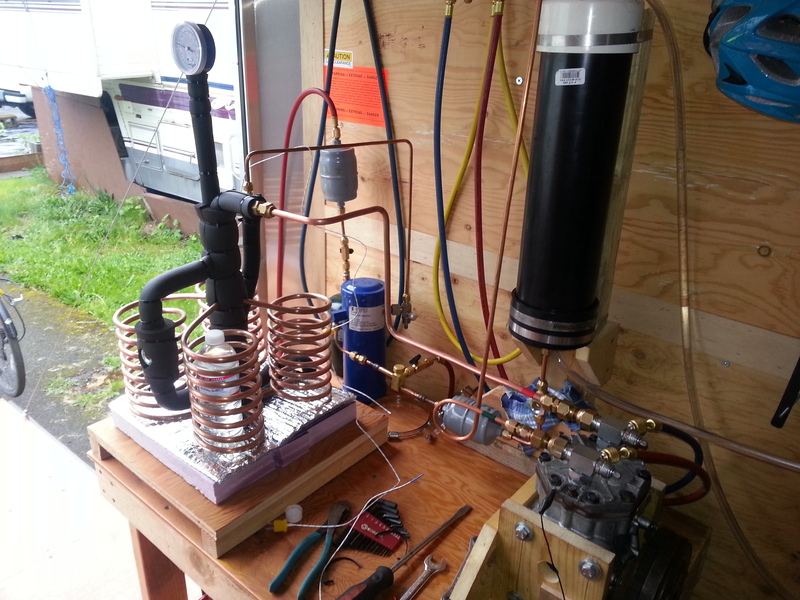 My brazing skills were limited, and I didn’t really have a specific goal being that we rented a home, and I didn’t really want to invest too much time and energy into building heating systems and the like. Here we are a few years later; We moved across the country, not really knowing what we were going to do for work, or where we are going to live, but here we are, living in a motorhome we own, on a rented space in a trailer park. I couldn’t pick a less ideal space to go head first into refrigeration projects, but nonetheless I couldn’t help myself. I’m not sure exactly what calls me to work with this stuff. Perhaps it is because the technology is so strange to people; most folks have little understanding of how their refrigerator works. Maybe it’s the beauty and craftsmanship I see in old refrigerators from the 1920s. Or perhaps, I feel the need to build better appliances because I am disgusted and disappointed with the performance and short life spans of the technologies commonly available. Whatever it is, I like heat pumps. I have no specific goal in this endeavor; whatever application or exploitable physical process, is what guides me. My plan was to start by building a pedal powered ice machine. Yes, you read that right. I want to build a human powered refrigeration device in order to determine how much water ice one operator can make in about one hour. Challenging? You betcha. Constructing such a device requires a compressor which can be directly driven with rotary mechanical work, rather than an electrically driven hermetically sealed compressor, so commonly found in modern refrigeration machines. Another interest of mine is to develop and implement gravity flooded evaporators. This is a technology commonly found in 1920s and 1930s household refrigerators, but has since fallen out of favor. Modern examples are primarily found in very large industrial chillers. The refrigerant control will be the largest hurdle to clear. Various methods of altering the conditions of a refrigerant during the compression process are to be explored to include: wet compression, dual effect compression with flash chamber, two stage compression with inter-cooler, and two stage compression with flash chamber inter-cooler. Along with many other system features, I’d like to develop a good dehumidifier, a dehumidifying clothes dryer, a better refrigerator, a waste water heat recovery water heater, and a domestic heating heat pump. I am a truck driver. I have only a high school diploma, some curiosity, a few old text books, and a brazing torch. Do not accept the unremarkable nature of domestic appliances. Ask yourself, “Why is this technology made to be discarded as the junk it is?”. We can do better. I intend to do better.